Some things in life you learn the painful way. My first son had 7 ear infections and antibiotics in his first 11 months of life. It was long before I had started my natural health journey. Since then I have learned a lot and am thankful for the the rough path that led us here. Here is some of what we’ve learned about gut flora. Due to the antibiotics, his gut flora became all messed up… all those good bacteria that live in you to make up 70-80% of your immune system. We have been working on the side effects of that ever since. 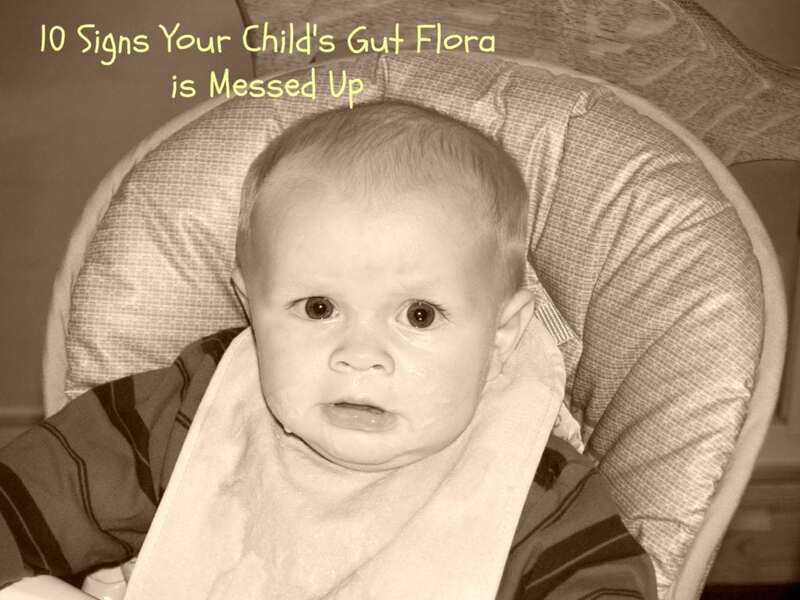 To save you some trouble-shooting, here are 10 signs your child’s gut flora is messed up. With the flora out of balance, excessive gas is produced. Your son/daughter may seem to be gassy all of the time! I know my son was. My son had chronic constipation. Pooping was a horrible thing in our house until we started healing his leaky gut from all the antibiotics. On the flip side he could have had diarrhea, but we experienced the opposite. When your gut flora is out of balance, your poop isn’t what it should be. We had three food intolerances until we healed his leaky gut over a several year process. Dairy caused a quick case of diarrhea. Soy caused extreme painful gas and diarrhea. Gluten caused severe stomach cramping. Not much to explain here other than your breath is reflecting what’s going on inside you. I’m sure you’ve noticed how sweet a newborn baby’s breath is…their gut flora is intact. Then life happens! They could have frequent diaper rashes or thrush while nursing. If they are a little girl they could develop frequent yeast infections. Without their immune system working properly, more frequent respiratory issues seem to pop up. Without a properly functioning gut, your body can’t absorb all the nutrients need leading to vitamin deficiencies. With a leaky gut food could just be passing right through frequently undigested so weight gain can be a problem. 10. Frequent stomach pain and bloating. I was up for 14 months with my son as he struggled through many of the above issues. Sleep and napping was never more than 3-4 hours at night. With extreme stomach pain and bloating, my son was miserable and I was exhausted! I have cited some websites below to give you more information. However, all of the information above I gained by living through it with my son and researching over the past 7 years of his life along with visiting numerous traditional and holistic minded doctors. I hope this can save you some of the problem solving that I had to go through. 1. Dukowicz AC, Lacy BE, Levine GM. Small Intestinal Bacterial Overgrowth. Gastroenterol Hepatol (N Y). 2007;3(2):112–122. Has Your child Struggled With Poor Gut Flora or Imbalances? Wow your Story sounds so much like my niece, I have recently learned about gut health and am becoming more aware of it, since starting my son on some supplements he has had huge improvement and so has my whole family! love your article!